Tires are more than something that your car sits on. Tires take more abuse than probably any other part of your car. Every day they have to go over asphalt, concrete, potholes, branches, rocks, nails and who know what else. Not to mention the weather that can cause havoc on the sidewalls and the rubber of the tire. One way to extend the life of your tire is rotating your tires. Rotating your tires is simply swapping them from side to side and front to back, that way if one of the tires is not wearing properly due to possible suspension problems you can swap it and keep it going for many more miles. Elkhart Mechanics can do this for you quickly and easily. Tires do not last forever, and the hot summers and cold winters in Indiana can be quite rough on the rubber that makes up your car’s tires. Not all tires wear out at the same rate, though, and that is why tire rotation is important. Tire rotation means moving each tire from one corner of your car to another. Front tires get worn out more quickly than rear tires, because they have to bear the weight of the engine. The added burden on front tires is even more pronounced in vehicles with front-wheel drive. Roads in the U.S. are designed in such a way that right turns are tighter than left turns, which means that tires on the right side of the car get more wear than tires on the left. Problems with your car’s suspension can also cause added wear to one particular tire. Rotating your tires can extend the length of time any tire can go without being replaced. It can also make your car’s handling and traction stay balanced. Many manufacturers recommend that you have your tires rotated every 5,000 miles, and some even require tire rotation in order to keep the car’s warranty. 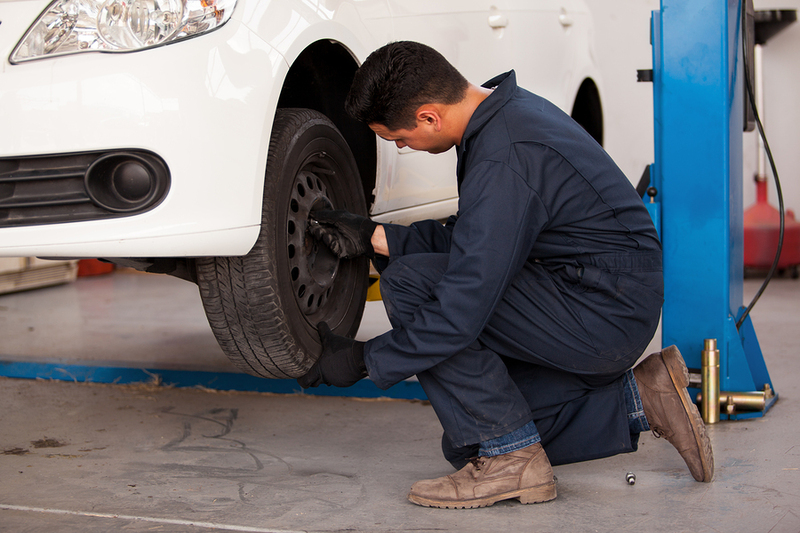 Elkhart Mechanics can rotate your tires in a time-efficient way and for a reasonable price. You may wish to have your tires rotated when you bring your vehicle in for an oil change; that is one of the advantages of a full service garage like ours. Some people choose to install different sets of summer and winter tires, and we are more than happy to install those for you to help get your car ready for the hot or cold weather. If you drive a lot on icy roads, we can also help you install and remove studded tires, which are only permitted from October to May.